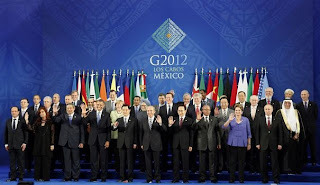 After 2 days of conferences ( on the 18th and 19th June 2012), the G20 finally closed its doors. Every head of government went back home. According to the official report of the G20, regarding the Europe has to continue its efforts to save its economy and that to define limits to the financial system: “The Euro Area members of the G20 will take all necessary measures to safeguard the integrity and stability of the area improve the functioning of financial markets and break the feedback loop between sovereigns and banks.” (http://www.g20.org). The efforts to rebalance global demand will be intensified through different levers. Need to implement financial reforms in order to make the financial system more trustable, stable, and resilient to support the economic growth. The promotion of the open trade and the resistance against the protectionism. Member countries affirm their willing and commitment on actions to maximize growth potential and economic resilience in developing countries. This information seems to be the continuity of the former G-20. Nothing very fresh. At least, even if the G-20 does not have brought new solutions on the table, the positive aspect is that Mexico has established its role and place in the Big league! American-development and canada2playa wish you a good week-end!